Europe is facing it’s most difficult challenge: how to create a united Europe? After the referenda on the new European Constitutional Law and the following disappointment about the French and Dutch NO, Europe is further away from unification than ever. But as a result inertia about Europa was replaced by genuine interest. What does it mean to be European? What do we represent? How much personal identity do we want to hand over to become a unity? Europe is an emerging network, a unity within the Union, a conglomeration of energy culminating in cultural exchange and collaboration without borders. The project deals with the European Union as a whole and wants to raise questions about Europe in the past, the present and the future. Is Europe a new country with new borders or a concept for freedom and equality? To start with, a new European flag was made. The stars are the capitals of the different countries, creating an abstract sky full of stars. 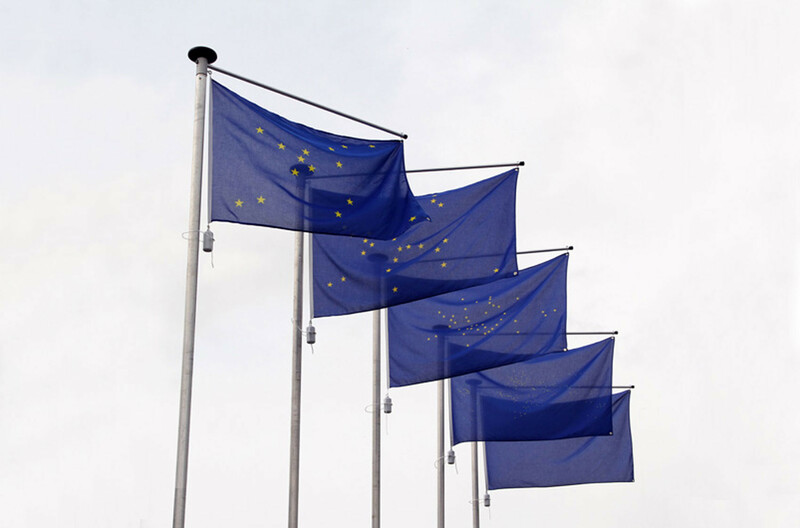 On the 9th of may, the official Europe Day, the new European flag was presented through the whole European Union, creating a unity for the first time ever. 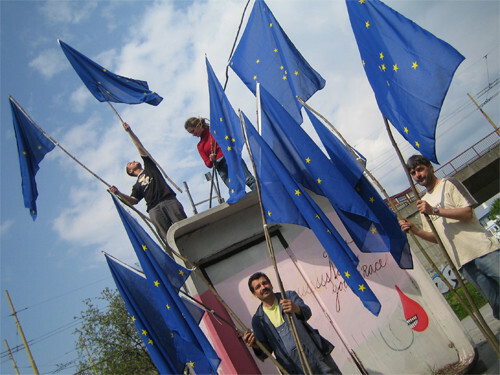 The 9th of may 2006 was an unforgettable Europe day; 50 art-institutes participated, presenting the flag in all 25 countries forming the European Union. Pictures of all different institutes flying the flag were taken on the 9th of may and put directly online. All pictures from all participating institutions were visible all over Europe. In 2006 there were still only 15 countries represented on the flag. The ten new member states of the European Union, which joined in 2004, have not been treated equally, for fear of a tidal wave of economic refugees. A special backdoor provision was created to allow each member state to implement its own restrictions (until 2011) against one or more countries at will. This inequality and discrimination is at odds with the founding spirit of the European Union. Because of this political statement, most positive reactions came from the ten new member states, which struggle every day against lack of recognition, racism and economic discrimination. Free movement of people, goods, services and capital should be implemented universally and immediately upon accession to membership of the EU. In the end Maarten Vanden Eynde (ERforS) decided to make five flags, every two years a new design, slowly zooming out more and more adding new stars until in 2014, the year that the European Union wants to be ‘finished’ and clear about who is part of it and who is not. 2008 includes all the current EU members, 2010 adds all the capitals of the countries that want to become a member or are part of the geographical continent Europe and in 2012 you see all the world capitals creating an open sky full of stars. If you zoom out far enough you see no stars anymore, no more capitals, no more borders. What is left is an open sky, the flag of our blue marble, planet Earth. It is a visualisation of a unity of diversity and questions both the relevance of closed borders and the constant geographical expansion. It is however a pro-European project, inviting people to think of the possibilities of Utopian Global Governance.